If you’re just getting started at DealDash you might be puzzled at all of the different ways that people use to bid on items. 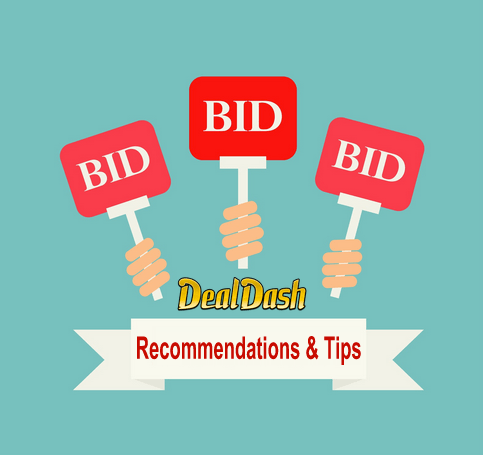 This guide is a continuation of last week’s handy guide to different bidding styles. The Hello/Goodbye: This particular bidder is very crafty and a little bit tricky. They usually check in at the beginning of the auction with a few bids, then stop bidding. You think that they’re gone, but suddenly they’re back again! This can go on and on for quite a while. It can get a little frustrating for the people who have been bidding consistently to not know if this bidder is going to pop up out of nowhere again, but hey, it’s a great strategy to throw people off of their bidding game. The MUST Win At ANY price: This type of bidder has always puzzled me, and you see this type of bidder most frequently when DealDash is running one of their 3X or 5X clock time promotions. The MUST Win At ANY price bidder will clearly over bid…And keep on bidding. Let me give you a great example. A little while back I was bidding on a $100 Toys R Us gift card. Pretty straightforward, right? I started bidding at the same time as another bidder, and we were both using our BidBuddies. As I was getting close to the BIN (Buy it Now) cost which of course is the simple formula of – price of bids X number of bids + final auction price – I figured that the other bidder had done the same calculations, and depending on what price they had purchased their bids would determine if she was going to win, I was going to win, or someone was going to jump in when both of us were out. Well, I hit the BIN cost, and shut off my BidBuddy. I had spent just about $100 in bids + final value, so I BINned the gift card, got my bids back, and wandered off to do something else. Imagine my surprise when I came back an hour or so later and this original bidder was STILL bidding! I couldn’t believe it, so I kept watching. The bidding went on and on until she eventually “won.” However, I wouldn’t really consider it winning since she clearly spent more on bids + final value. I took note of her bidding name, and whenever I noticed that she was bidding I would watch, and this The MUST Win At ANY price bidder seemed to do the same thing at every auction. It makes no sense to me, but hey, that’s the great thing about DealDash – you can bid ANY way that you would like, it doesn’t have to make sense to anyone but yourself. Those are just a couple more of the ways that people like to bid on DealDash. What’s your favorite way? Please stay tuned for future blogs where I will discuss more advanced ways to bid. For now, check out the auctions and see what you would really like to bid on, and try my tips to save bids. See you on DealDash everyone! Good luck and happy bidding.